If you regularly buy yogurt, you may have noticed Greek style yogurt in your grocery store's dairy section. Perhaps, you may have come across a recipe specifying this type of yogurt, which may leave you to wonder how it differs from other brands of yogurt you typically buy. Yogurt is a part of nutrition and healthy eating, helping you get adequate amounts of dairy products in your diet. It is an excellent source of calcium and high in protein. If you don't particularly like drinking milk, there are many tantalizing flavors of yogurt available leaving no reason for why you cannot get your daily recommended allowance of calcium easily. Many types of yogurt are available with a range of fat content from regular to low fat to fat free varieties. Then, there is Greek style yogurt. This style of yogurt most closely emulates full fat versions of regular yogurt, with the fat content in the nine to ten percent range. Regular whole fat yogurts have upwards of 3.5 percent fat. The fat content is higher in Greek yogurts because it is a blend of both pasteurized milk and cream. The fat content gives the yogurt its characteristic consistency. Low fat yogurts use gelatin or other stabilizers which can affect the appearance and texture. As you can probably guess, the fat gives Greek yogurts a creamy texture with a good mouth feel. You may feel like you are eating custard rather than yogurt. Bear in mind that the higher fat content also means more calories, something to watch for if you are watching your caloric intake. Another major difference between Greek and non-Greek yogurts is with water content. Part of the process of making yogurt includes straining to remove water from the finished product. 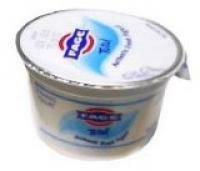 Greek yogurts are strained three times versus the two times of regular yogurts. The result is a yogurt which is denser and firmer in consistency.You will notice the difference when you eat this type of yogurt, of course. It may also lend itself better to recipes which call for yogurt, especially those for marinades or coatings for meat. The yogurt base may cling better, making it easier to cook with. Some lines of Greek yogurt such as Greek Gods® contain probiotics. Probiotics support the functioning of your immune system by introducing so-called good bacteria in your body. These probiotics can help your body digest foods more easily as well as improve absorption of vitamins and minerals. They may also improve gastrointestinal issues. There are several retail brands of Greek style yogurt available. Brands such as Krinos®, Fage®, and Dannon® offer their own renditions of this yogurt style. If you cannot find any at your grocery store, try looking for them at a health store. You can also purchase yogurt online. Another option is to make your own Greek yogurt. Companies such as Easiyo sell yogurt bases to create your own versions. You can also use plain yogurt as a base for your recipe. Your flavor options are only limited by your imagination. Try adding fresh fruits, nuts, and honey to your recipes for endless variations. Yogurt can lend some interesting and tasty variations to your recipes. 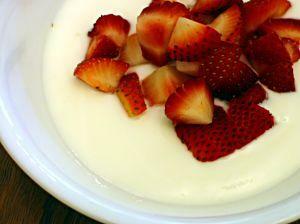 Try using Greek yogurt as a highly nutritious substitute for sour cream in dressings or sauces. You can also use it as a creamy replacement for mayonnaise in your favorite chicken or egg salad recipe. It can also make a nice tangy base for pasta recipes. Greek yogurts are a nutritious source of calcium and protein, making them the perfect addition for a healthy diet. The rich consistency makes them a pleasure to eat and enjoy. If you are looking for something new to bring to the table, try a Greek yogurt on its own or in your favorite recipe.